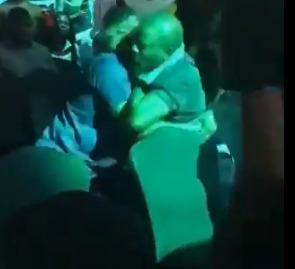 The two men fighting A video of a husband attacking another man for taking his wife to Burna Boy’s concert which was held in Lagos on Wednesday night, has surfaced online. According to eyewitnesses, the husband was so angry that he mercilessly beat up the other man after he found him with his wife at the venue. Watch the video below.